Seeds of Decay offers strong nostalgic ties to the history of the game while maintaining high powered gameplay. Note to readers: Much of this review is geared towards those already familiar with The Legend of the Five Rings CCG. In the wake of several errata on existing cards aimed at bringing a few abusive decks back in to line, Seeds of Decay brings previously struggling factions closer to the pack while also giving the successful Clans new and different tools with which to decide the direction of the future of the Emerald Empire. Seeds of Decay brings the first expansion cycle of the Emperor Edition arc to a close with new Strongholds featuring the Mantis, Scorpion and Dragon Clans, once again giving all the main factions equal options in deck building. As with the previous expansions of Emperor Edition, Seeds of Decay gives the featured clans new Strongholds that offer a new take on an already existing theme within their faction. Dragon gets to explore the power of their fire-breathing tattooed monks, the Scorpion can now attack from the shadows with a ninjitsu embodying redirection tactic, and the Mantis seafarers get an updated take of a powerful mechanic from Lotus edition in a new Magistrate-based “raiding” deck. Seeds of Decay continues the trend that has constantly proven itself in the Emperor Edition arc; the art is fantastic. Where this set outdoes its predecessors is in the storytelling found within the art itself. Several lines of samurai drama play themselves out across multiple cards, with many characters appearing on many cards, one really gets a sense of the fluidity the story has simply by looking at the art. Of particular note is the emerging rivalry and even open conflict between two Personality cards, Kakita Yusugi and Bayushi Makubesu. They observe and even confront each other over a handful of cards, yet we never know the final outcome of their story. Hopefully this form of storytelling is something the tournament players embrace and choose their tournament wins to reflect on, so that more of these minor plots get flushed out. The mechanical balance within the set it self feels really well done, and booster drafts using this set should provide interactive and interesting games. Where the mechanics really begin to take off is in the boosts that this set offers some of the lesser themes Clans have had at the beginning of the tournament arc. Struggling themes see some potent Unique Personalities to beef up their ranks, as well as some very interesting Fate deck support across the card type spectrum. The Holdings are solid and provide many new utility options, and the new keywords of Brash and Overconfident (both of which give your opponent some card advantage in exchange for an undercosted Personality) give Personality selection in decks some spice. The use of reminder text on these two keywords also is really nice, especially for newer and more casual players, a trend we can only hope continues for new rules affecting keywords going forward. In truth, the only card type to see a completely flat response seems to be in Regions, where Tested Land (the lone Region in the set) just doesn’t even seem to be on the same level as player favorites “The Second City” from Forgotten Legacy and “Natural Aviary” from The Shadow’s Embrace. Veteran players may feel a bit uneasy from seeing the return of the raiding mechanic with the Mantis Stronghold, and a nod to the over-the-top Lotus Stronghold “Warrens of the One Tribe” in the new Strategy card “Learning.” Both of these reimaginings of old mechanics caught the player base off guard during preview season, and understandably are looked upon with wary eyes, as their predecessors drove many of the more casual players from the game when they dominated the tournament scene of late Lotus. How exactly they will affect the game this time around remains to be seen, but given the overall power level of the environment in general, they don’t seem to be as deforming this time, and with their design tempered with the memories of the past, they should fit right in to the Emperor arc without upsetting the balance. Overall, Seeds of Decay gives Legend of the Five Rings another great expansion. The set hits all the right notes mechanically, while still offering the great art and flavor players have come to expect from this brand. Even with the small stumbles from the erratum and the echoes of Lotus, AEG has boosted its flagship game with the best expansion of the current story arc and given tournament players from all Clans tools they needed to compete, while the scattering of subthemes introduced give the kitchen table players new interactions and tricks to play against their friends. With the Empire continually distracted by the conflict with the Dark Naga, the samurai in the distant Colonies slip farther from the traditions of their homeland and embrace more pragmatic means of accomplishing their duties. Championing this new philosophy are the proscribed texts of Fudo, an ancient and censored prophet of the Brotherhood of Shinsei. Seeds of Decay is the brand new expansion for the fan-favorite Legend of the Five Rings Collectible Card Game from AEG. It is part of the Emperor Edition Arc, which acclaimed base set released in the beginning of 2012. Far away from the eyes of the Empire, tensions grow between the Clans in the Colonies, as once forbidden texts reemerge. The seed has been planted. Will the Clans embrace this new philosophy? Featuring Dragon, Mantis and Scorpion Clan starter decks. 159 total new cards legal for the Emperor Arc, including 1 exclusive fixed card and a theme-oriented Stronghold in each Starter Deck and L5R’s 10,000th card! Conflict rages on between the Clans in the Colonies as they vie for supremacy over a new land with little Imperial supervision. 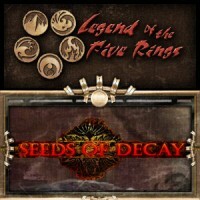 Add a Review for "Legend of the Five Rings – Seeds of Decay"